YOU FOUND IT!!! The Perfect Family Beach Vacation! Charming Beach Home Only a Short Walk to the Beach. 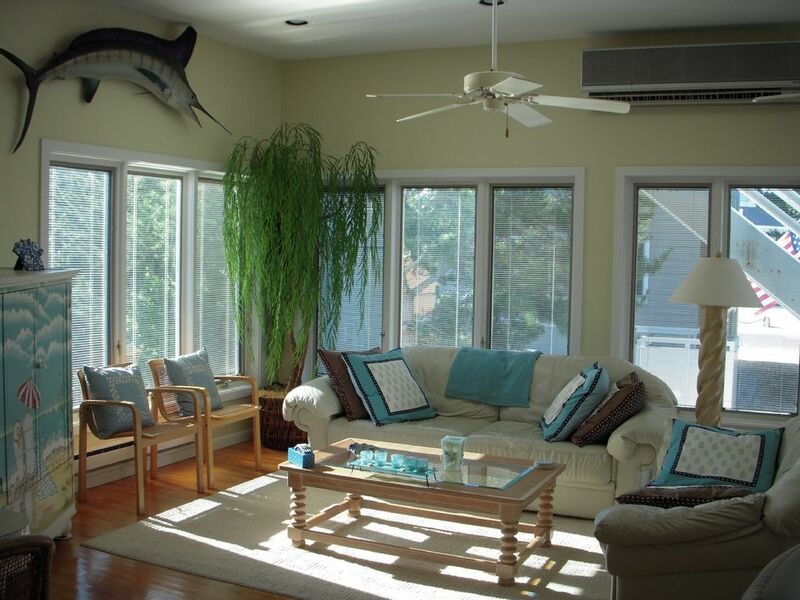 Can be seen on vacation rentals lbi. This bright spacious beautifully maintained beach property is located in a quiet neighborhood at the south end of Long Beach Island, NJ. Just a short walk to the beach with 3 miles of coastline bird sanctuary and views of Atlantic City Skyline from the beach. Sit on the beach and soak up the sun! Enjoy breathtaking sunsets from your large roof top deck and panoramic views of Little Egg Harbor Bay and ocean. Ceiling fans in all rooms, air conditioned, 3 TVs, DVD, VCR, WiFi. Reversed living with large living area, dining area and open kitchen on second level. Four bedrooms, one with King Size bed, one with Queen Size bed, and two with 2 twin size beds each, plus Queen Size sofa bed. Large windows add great natural light. Over-sized outdoor shower. Four houses from the beach. Great surf and deep sea fishing, surfing, water sports, biking, walking and lots of fun dining and entertainment. Only 2 miles from Bay Village and Beach Haven restaurants and shopping. Enjoy free LBI bus shuttle. Pick up right at our driveway. LBI shuttle app keeps you informed at all times of bus location. Only 2 hour drive from New York City's Broadway Theater District and shopping. Nearest Airport is Atlantic City International (30 miles). Also convenient to Philadelphia, PA (PHL) and Newark, NJ (EWR) Airport. Casinos & Shows: Atlantic City Casinos and Premium Outlet Shopping within an hour's drive or jump on the free Trolly Tour Bus at the corner and you will be dropped off at the ShowBoat Casino and Hotel. Top-rated Entertainment at the Atlantic City Casinos. My family had vacationed at LBI for 10 years before my parents bought this house. My house gift to them was the sign out front that still remains and means so much to us all "AT LAST". AT LAST we finally had a house of our own. And now we travel from Virginia to get there so, AT LAST we have finally arrived!!! The memories have gone on for 4 generations. My husband and I started dating here shortly after my parents bought the home. I was a summer hostess at the Bay View Manor. (Townhouses now) We celebrated our 41st anniversary last July. Our children started coming here as babies and now our grand babies are enjoying the sand between their toes. This home has brought our family and friends so much joy that we are now sharing it with you! Who could turn down Morning Coffee on the upper rooftop deck watching the sunrise or reading a great book or enjoying the perfect cocktail watching our beautiful sunsets over the bay. Large comfy living area with open kitchen concept. (by the way fully stocked kitchen with every gadget you could possibly need) This IS the perfect house for a memorable family beach vacation! Love our huge outdoor shower. A must at the beach! Dining area has seating for 8 at the table PLUS 3 more seats at the breakfast bar. Loved, loved, loved the home!!! Beach Haven needs to do something about the beaches in Holgate, they are horrible, 3’ wide with an 8’ drop. Not suitable for anyone. And the fact that they want you to pay to go on the beach is disgraceful. The house was located within walking distance to the ocean and bay. Close to a deli for convenience, yet on the secluded, quiet side which we found rather pleasant. House had everything we needed. Carin amd Steve (Benjamin) G.
This was our third year visiting and my family loves staying in this house! The great room, kitchen and dining area are perfect for family gatherings and family game competitions. The kitchen is incredibly well-stocked with tools and equipment for a vacation home so making big family meals is a pleasure. We enjoy our "cocktail hour" on the roof whenever the weather cooperates. We love the accessibility of the beach just a block away and appreciate that the house has beach chairs for everyone readily available. Our family selected this home for a 4th of July family get-together and it was perfect for us. The open design of the family room, kitchen, and eating area was perfect for the 7 of us sharing food, games and conversation. The upstairs roof deck was a real treat for both breakfast and dinner meals, as well as viewing fireworks. The house is tastefully decorated and well-maintained. The kitchen equipment was put together by a real foodie -- there wasn't anything that I needed that I couldn't find. I was able to create wonderful meals easily either stovetop or grill. We would definitely recommend this property to friends and relatives. The beach at Holgate is lovely and feels a little more secluded. We enjoyed taking walks/runs every morning since the end of LBI Boulevard wasn't very busy. We also enjoyed shopping and dining in the Beach Haven area. The house is well furnished,immaculately clean and away from the commercial part of the island but just minutes away from stores and restaurants to take care of your needs. The house sits at the tip of the south end of the beach so it's not crowded and minimal traffic. Highly recommended. The owners are a pleasure to work with and extremely hospitable. We traveled to Long Beach Island from the mid west for a family vacation. The house was wonderful and met all our needs. We loved the open rooms on the main floor and the bedrooms and baths more than met our needs. The kitchen was well stocked with everything we needed to cook. The deck has amazing views and we often began and ended our days enjoying the ocean breezes. We were a perfect distance from the beach...just by the lifeguard station. The owners left great suggestions for restaurants and places to visit. We especially liked the corner store...we ate too much homemade coffee cake. We are planning to return another summer. Surf Fishing, Deep Sea Fishing, Clamming, Crabbing, Surfing, Short Walk to Beach, Biking, Walking, Local Exercise Classes, Massage/Spa, Boat and Jet Ski Rentals, Parasailing, Maritime Museum, the Forsythe Wildlife Refuge which is 3 miles of coastline bird sanctuary, Mini-Golf, Public Tennis Courts, Fantasy Island Amusement Park, Surflight Playhouse Theater, Arts & Crafts Fairs, Beachfront Dining, Open Air Dining, Dance the night away at local nightclubs, Historical Barnegat Light House, Great Shopping. The Atlantic City Casinos and Atlantic City live concert performances only 1 hour drive. Golf: Public Golf Course in Manahawkin, about 12 miles. Atlantic City Casinos and Premium Outlet Shopping within an hour's drive.